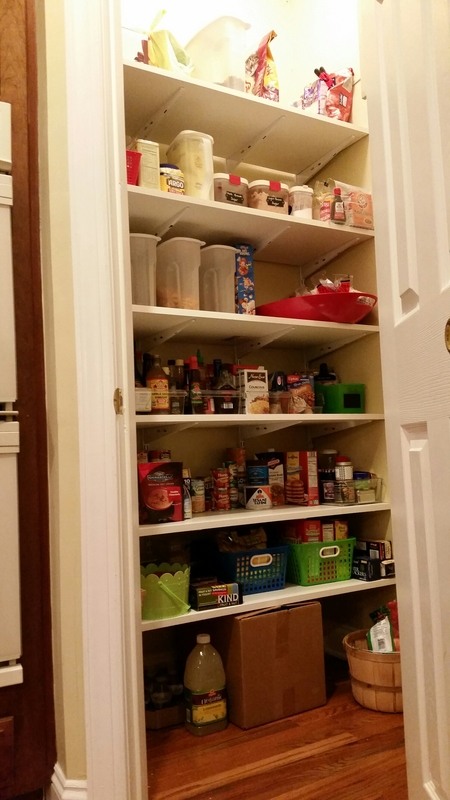 Rebuilding our pantry | Tales From The Ipe! Lather, rinse repeat. We’ve cleaned out nearly all of the kitchen, except for two drawers in the kitchen desk. During the Saturday of our recent January blizzard weekend, my wife completed cleaned out the pantry, wiped it down, and reorganized it. It is (or was, and I’ll get to that) wire shelving that you can find in any home improvement store. Wire shelving is good because it’s cheap and easy to cut and customize. Wire shelving is bad because small stuff (like bottles) will easily tip over or fall. Annoying. This is the original shelving from before our time, and we planned at some point to put in something better. When? Oh, probably when we had scraped together enough money in a few years. Or when bad luck rears its ugly head and forces us to take action sooner rather that later. Perhaps less than 24 hours after cleaning aforementioned pantry. The Sunday of that same January blizzard weekend, after I had made breakfast for everyone, Lily was instructed to clean up and put away stuff. Beknownst to us, Lily has put stuff away in the pantry many times. Unbeknownst to us, she has found that she can climb the pantry shelves and put stuff away on the top shelf. Well, until that fateful Sunday morning, when the shelves finally gave way, tore out of the wall, and everything came tumbling down. Thankfully, Lily was more scared than hurt, and cleanup wasn’t too bad. However, we had no pantry. We put most of our pantry items on the dining room table, and looked for options. We called in our Closet Factory sales rep, but much like their mudroom estimate, it was extremely expensive for what we were going to get. I’m talking over $800 for a glorified bookshelf in the pantry. No thanks. In the end, we had another neighborhood contractor we’ve used in the past to help us out. We went to Lowe’s to look at our options, researched online, and designed new simple shelving using wall brackets, supports, and melamine boards. I’d figure out all of the measurements, buy all the supplies, and our neighborhood handy man would take care of the install for only $60. Done! Over the course of two weeks, we picked up paint and other supplies. I demo’d all of the wire shelving, mounts, and other supports. Removed all of the pesky wall anchors. Spackled, sanded, and we painted the pantry. 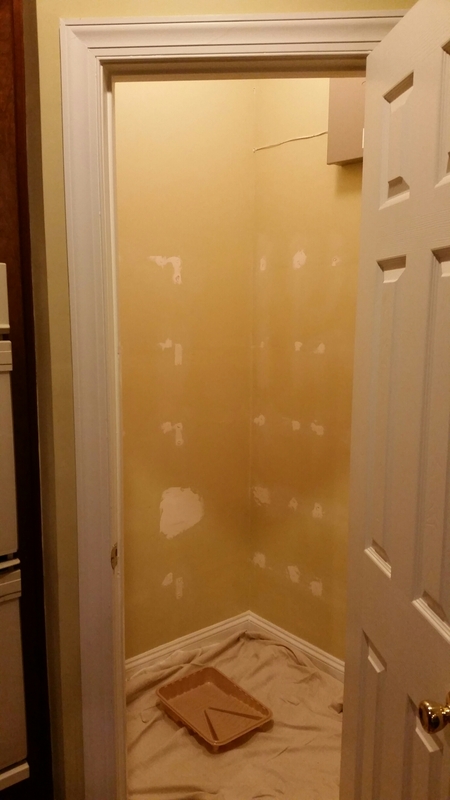 Last Thursday night, we finished painting the trim and the pantry walls. Friday morning, our handyman came over, and cut and installed everything while I was at work. On Sunday, we put everything back in the pantry. We weren’t able to recreate the original shelving-on-two-sides-of-the-pantry but with the new deeper shelves plus an additional 5th shelf, we surprisingly fit everything back in the pantry again. And it’s more roomy with one wall of shelves vs two walls. Pretty cool. The pantry is done, but it’s not done forever. In the near future, we’ll be on the lookout for pantry drawers and potentially a new brighter light fixture. But for now, we have a new pantry. The pantry with all original shelves removed, holes patched. The pantry put back together, and restocked. This entry was posted in News and tagged home improvement, kitchen. Bookmark the permalink.